short girl, long island. 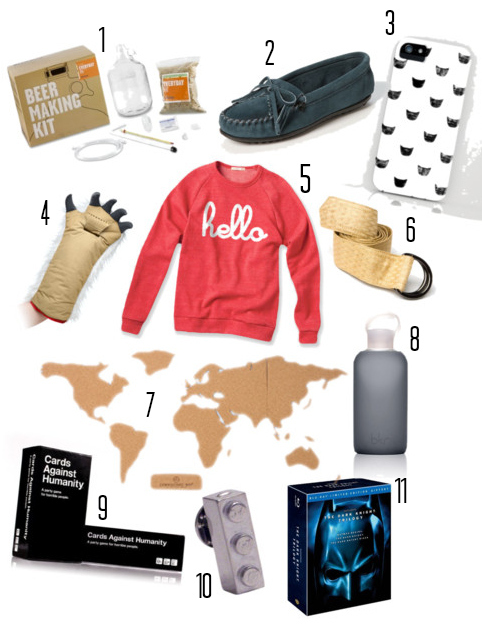 : Gift Guide: Under $50. After creating the Under $20 holiday gift guide last night, I decided to toss another one together, for under $50. Why? A few years ago, my brother + set a $50 limit for gifts, so I wanted to get him one big present, plus one or two small things to unwrap. I figured some of you might be doing the same, so I figured I'd add some more. Again, some of these items have coupon codes [which I have added for you] + some offer free shipping as well. 1. Everyday IPA Beer Making Kit $39.95 If you know a beer snob, but feel like giving them bottles of beer is kinda tacky, give them a kit to make their own brews! It'll be fun to create, plus, they can proudly serve their own beer to friends. Who knows, they might even start home brewing on the regular, thanks to you! 2. Minnetoka Kilty Suede Moccasin $39.95 Instead of getting the ladies in your life slippers that won't ever see the light of day, get them a quality pair of moccasins. Not only can they wear them around the house to keep their feet warm, they can wear them out + about year round! Instead of tan or brown, try a pair in teal, wine, or mustard. 3. Leah Reena Goren Black Cat iPhone Case $35 This cute case comes in three sizes: 3G/3GS, 4/4S + 5, which is a plus - its so hard to find cute cases in all three sizes. If you're not a cat person, check out the other cases Goren has designed - you're bound to find one you like. 4. Star Wars Severed Wampa Arm Ice Scraper $24.99 If you know a Star Wars fan that has to deal with snow, this is a must have. Not only does it look awesome, but it'll keep your arm + hand warm while you do it. If you've ever had to use an ice scraper when you've forgotten to grab gloves, this will be a lifesaver. 5. Hello (Adult) Red Champ Pullover $50 on sale for $35, plus save an extra 20% with the coupon code HAPPY This unisex sweatshirt is super soft + comfy. If you're snagging this for a gal pal, order a size down, as the sizes are listed in mens. If you want it super oversized, order a size up. I usually take a small in these, but ordered a large. Its like a mini sweater dress on me + I love it. I can't wait til they launch new designs - I'll have an order placed in a heartbeat! 6. Gold Buttercup Silk Fabric Belt $42 $31.50 with coupon code HOLIDAY Dress up a black dress or your favorite pair of jeans with this belt. This statement piece can be paired with neutral shades or bold tones, whatever you're in the mood for. 7. The Corkboard Map, $45 33.75 with rep code ShortGirlLongIsland This corkboard is great for offices, classrooms + bedrooms. The board is self adhesive + comes with sixteen map pins. 8. bkr Reusable Water Bottle $28 Fact: drinking water out of fancy bottles makes it more fun to drink. Plus, you're saving the earth + some cash by shunning plastic bottles that can leach chemicals [yum]. If you're not a fan of the color of the silicone screen on the bottle pictured, Spirit Beauty Lounge carries bkr bottles in fourteen different colors. 9. Cards Against Humanity $25 WARNING: this game is not for children. With that said, this is probably one of the funniest games I have ever come across. Its similar to Apples to Apples, but Cards Against Humanity blows A2A out of the water. You might want to pick up some Depends, cause there is a good chance you'll pee your pants laughing. 10. Building Block Tie Tack $44.99 Jazz up ties with this sterling silver LEGO-looking tie tack. If you spend more than $45 at Perpetual Kid, use the coupon code PKFUN to save $5. 11. The Dark Knight Trilogy $52.99 on sale for $27.96 Snag this Blu-Ray set for the Batman fan in your life, you can't go wrong for this price! If you are sans Blu-Ray, don't fret - you can snag the trilogy on DVD for $17.96. I want all of this! Great picks -- that cork board map is legit I need that in my office! I really like the cork board map! I can't stop thinking about teal mocs now.